Well, at least the Puppy Bowl was good. Not only was it a boring game, it was a very uni-uneventful game. The most uni-notable player was Rams defensive back Aqib Talib, who had a seriously messed-up sock situation going on (see above). • Pats quarterback Tom Brady wore his Riddell VSR4 helmet for the final time. Starting next season, that helmet is no longer eligible for on-field play. • Prior to the game, Eagles defensive lineman Chris Long was named the latest winner of the Walter Payton Man of the Year Award, so he’ll wear the Payton patch on his jersey starting next season, just like Saints quarterback Drew Brees, Panthers linebacker Thomas Davis, Cardinals wide receiver Larry Fitzgerald, Giants quarterback Eli Manning, and Texans defensive lineman J.J .Watt. Now let’s just hope they don’t use that gold football. I love this. There’s more inspiration and heart in that kid’s shirt than in a million overpriced polyester shirts. Good for him! BSA/NFL mashup: On the left is the logo for the Boy Scouts of America; on the right, a photo of mini-helmet that reader Chris Quinlan posted yesterday on Twitter. As you can see, it features the BSA logo, but with the shield of stars replaced by the NFL logo. I’ve never seen anything like that before. Chris says his brother wasn’t involved in the Scouts, so it’s a bit of a mystery how this mashup logo came about. Very interesting, though! See ya in the funny pages: My friend Nate sent me this comic book cover yesterday. Said it was published in January 1970, and the cover artist was Tony Tallarico. I hadn’t seen it before. Looks sweet! I poked around on the internet to see if I could find some of the interior pages but came up empty. Does anyone have a copy of this? ITEM! New raffle: The Chicago Fire are generously offering one of their new jerseys for a Uni Watch raffle. The lucky winner will be able to choose either the primary red design or the secondary white design, both shown above. You’ll also get your choice of size, from S to XXL. To enter, send an email to the raffle address by this Thursday, Feb. 9, 7pm Eastern. One entry per person. I’ll announce the winner on Friday. Good luck! Man, it’s just the perfect dish for cold weather — rich, homey, filling, comforting. And so many distinct flavors and textures! Duck confit, pancetta, sausage, white beans — so good! I’ve never made cassoulet myself (I helped a bit when a friend was making it at his house, I think in 2007, but he did most of the work). That’s definitely going to change before this winter is over. Coming soon, or at least soon-ish, to Culinary Corner! Baseball News: More MLB St. Patrick’s Day hats are beginning to appear. … During a 1992 NFL game, Atlanta Falcons Andre Rison wore a World Series cap as a shout-out to his erstwhile teammate Deion Sanders, who was playing with the Braves in the 1992 World Series at the time. Rison inscribed Sanders’s Braves and Falcons uni numbers on the cap, along with his “Prime Time” nickname (from Douglas Ford). … The Wisconsin Historical Society posted a picture from the Wisconsin State League, an early 20th-century minor league (from R. Scott Rogers). … New throwbacks for Lafayette. Football News: Looks like we haven’t seen the last of NFL games being played across a dirt baseball infield after all, because the Raiders will reportedly play their 2019 home games in the San Francisco Giants’ ballpark (from several readers). … Cross-listed from the baseball section: During a 1992 game, Falcons WR Andre Rison wore a World Series cap as a shout-out to his erstwhile teammate Deion Sanders, who was playing with MLB’s Atlanta Braves in the 1992 World Series at the time. Rison inscribed Sanders’s Braves and Falcons uni numbers on the cap, along with his “Prime Time” nickname (from Douglas Ford)…. The Smithsonian released a short documentary about the humble football helmet (thanks, Phil). 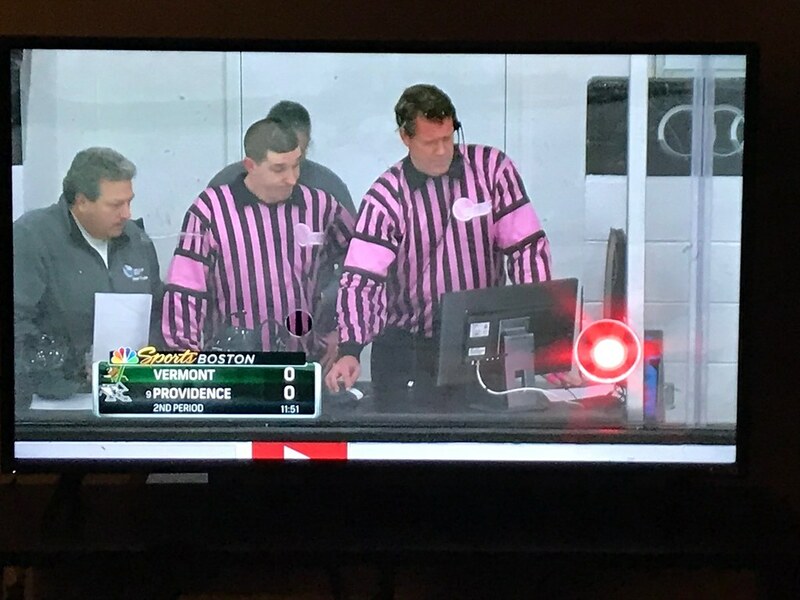 Hockey News: Providence held a Pinktober-in-February game Saturday against Vermont which from a uni-related perspective consisted of only the officials wearing pink. “Go Cats,” says my brother Nate Rathjen. 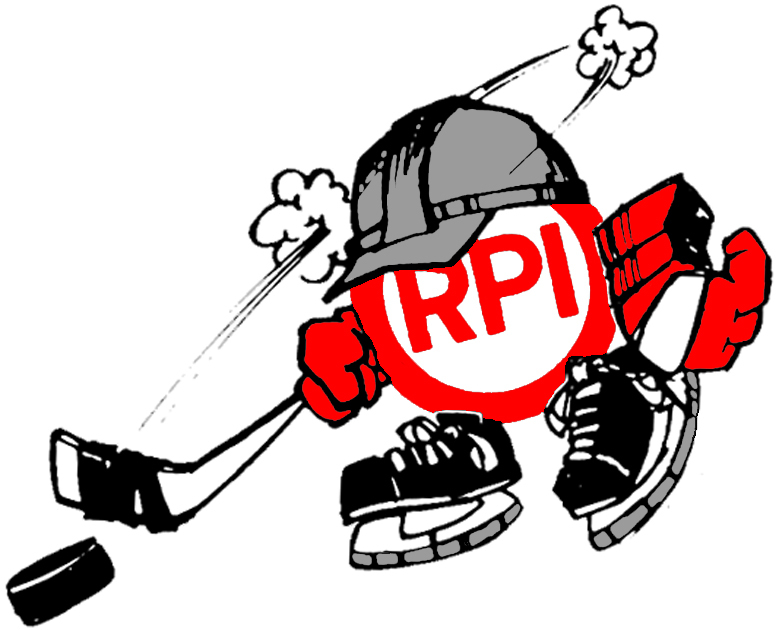 … Also, I don’t know if we’ve mentioned Providence’s hockey-playing friar logo. … The AHL’s Charlotte Checkers also did Pinktober in February, except their jerseys had a backwards Hurricanes logo sleeve patch; the logo always appears with the black half on the left (from Matt Campbell). … Two Canadian universities, the University of Québec at Trois-Rivières and Carleton, played an outdoor game at Saint-Tite, Que., in a stadium that hosts a rodeo every year (from Wade Heidt). … Also from Wade: the QMJHL’s Québec Remparts wore throwbacks for the 50th anniversary of the league, which counts a different franchise of the same name among its founders. Basketball News: Wake Forest G Aaron Spivey had his shorts on backwards yesterday (from Rob Ticktin). … Purdue wore throwbacks against Minnesota (from @jffdmrly). … Maine wore blue alternates against New Hampshire, who wore darker blue. … New Bulls SG Timothé Luwawu-Cabarrot wears No. 7 (from Etienne Catalan). Soccer News: The NWSL’s Seattle Reign are to move to Tacoma, Wash., for next season because of a lack of suitable stadiums in Seattle — they played at the city’s 70-year-old high school football stadium — and renamed themselves Reign FC with the corresponding removal of “Seattle” from their crest. … From the same league, the Chicago Red Stars are having a design contest for this season’s scarf (from Steve Johnston). … Manchester United wore their usual combo for European competiton of red/white/white against Leicester City (from Josh Hinton). … English League One teams Coventry City (sky blue) and Gillingham played a mono-blue-vs.-mono-blue matchup. … Italian team Inter Milan wore NOBs in Chinese for Chinese New Year. Grab Bag: Formula One team Sauber were renamed after their advertiser, Alfa Romeo, marking the first time since 1985, when the manufacturer stopped running its factory team, that a team with the Alfa Romeo name will be on the F1 grid. … In rugby union, Italy and Benetton fly-half Ian McKinley, who played his first Six Nations game this weekend, always plays with a pair of goggles after losing sight in one eye during a game in 2012. … Here’s a website devoted to one guy’s collection of air-sickness bag designs (from Steven Lobejko). What Paul did last night Friday night: On Friday night I was lucky enough to be one of 500 men who packed into the gymnasium at St. Margaret of Cortona School in the Bronx, which was holding its 50th annual beefsteak fundraiser. Just like at any beefsteak, there was the usual assortment of beef, beer, and fun, plus they had some very nice giveaway caps, but the added attraction of the St. Margaret’s beefsteeak is that Yankee Stadium organist Ed Alstrom always shows up and plays. Looking forward to attending this same beefsteak again next year! Providence’s skating friar dates to 1973, and is the primary logo for both men’s and women’s hockey. I can’t think of another college that has a completely unique logo for one sport. I think Georgia had a women’s basketball logo with a lower-case cursive G, a basketball, and a Venus symbol. Wikipedia states that the Tennessee women’s basketball team is the only women’s team at UT that uses that nickname (and its corresponding logo). There is another. My alma mater. University of Regina. The Regina Rams were a junior football team founded in 1954. 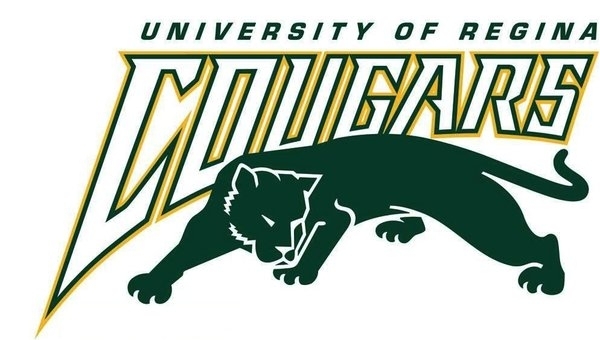 In 1999, the organization developed a partnership agreement with the University of Regina. The organization left CJFL junior football and became the university’s football team in Canada West conference of what is now U Sports. The school did not have a football team prior. Well, thank the uni gods for that. Still holding out hope for a football uniform and dreading a clown suit. I wonder if the continuing improvement of helmet tech, as well as the final phasing out of the old models like Brady’s Riddell, might signal a lifting of the stupid one-shell rule in the not-so-distant future. Which would allow the Jets to wear throwbacks (either or both of 1965-77 or 78-89) and thus soften the blow if the “new look” is a disaster. Assuming the new helmet shell is either white or green, one of the team’s major uni eras should be throwback-able, even until the current helmet rule. Right; which leaves me having to hope that the new shell is white so they can throw back to the superior 1965-77 uniform rather than the 1978-89 version. I wouldn’t be thoroughly opposed to adding silver or grey to the color scheme (I think we’re far enough removed from the 1974-84 Eagles to make comparisons inapt), inasmuch as jet planes tend to be that color, and I’m still hoping against hope for numerals that evoke the tail numbers of military jets, so I’m thinking perhaps a grey or silver helmet shell might be in the offing. I guess what I’m really hoping for is that they stay with the current white helmet and just change the stripes and decals to kelly green; maybe, if they add silver/grey, have a silver/grey center stripe flanked by the green stripes, and outline the logo oval in silver/grey. I’d rather see that than a green helmet that would be throwback-able to 1978-89, although a green helmet with white and silver/grey center striping, and the current logo outlined in silver/grey, wouldn’t be so bad. One thing we can be sure of: no matter what the Jets come out with, everybody is going to hate it. Very likely. Mainly because there’s nothing wrong (apart from the jersey coloration and the green-over-green combo) with what they currently have, and for the additional reason that they’ll be the only New York team not wearing a traditional, old-school design. Did anyone notice the player during the Super Bowl wearing the big gold necklace? I was at a Super Bowl party and I don’t remember which player it was, but a few other people at the party mentioned it. I even said after they mentioned this that “I’ll probably read about it on this website that covers uniforms”. People were speculating that this is against the rules. Lots of NFL players wear necklaces. It is not against the rules. Interesting. I would have guessed it was. Is it against the rules for the NBA? I remember when Kareem Abdul Jabbar was first in the league wearing a crescent moon and star Islam necklace. I noticed cordarrelle patterson wearing several gold necklaces. They were pretty tight, probably so they wouldn’t get in the way. Awesome DIY jerseys today. Interesting note: I’m a relatively recent Uni Watch reader, and the first time I came across the site was Steve’s Kap jersey project post in 2013. It’s the very first time I read Uni Watch, despite being into jerseys most of my life (with various periods of disinterest/inactivity). It definitely got me interested again in in making jerseys, which I dabbled with when I was young, leading me to where I am today, deeply immersed in the hobby. I’m glad helped to inspire you! The gold football is not a bad idea. Loved the cameos in the commercial — Jim Brown, the ’72 Dolphins, Joe Montana, Pat Mahomes, Odell Beckham … and Franco Harris! Have to disagree about the gold football. Can’t see any iteration that wouldn’t look like a tacky gift shop souvenir. I would have loved to see the NFL use different colors for the end zones.. Rams in yellow and Pats in Red.. I see nothing wrong with the NFL’s 100 logo. It’s the number 100, so what? Was it supposed to be in a shield or something to be acceptable to the readers of this material? Seems to be a whole lot of nothing to critique with such vitriol. And I hardly think I’ve subjected it to “vitriol”; I’ve simply described it, consistently, as “crummy,” because that’s what I think it is. Great work, Steve, as always, on your DIY jersey t-shirts! I love the detail of using different versions of the NFL shield on the different jerseys – the current shield on the white one, and the old shield on the throwback jersey. Nice touch! Thanks! And I’m glad you noticed! The look I was going for was as if the blue jersey came straight out of 1999. Oakland Raiders playing home games in San Francisco. San Francisco 49ers playing home games in Santa Clara. Sounds about right. New York Jets and Giants in New Jersey…who cares anymore? Dallas Cowboys playin in Austin, TX. Washington NFL team playin in Landover, MD. Buffalo Bills play in Orchard Park, NY. You could go on and on. I agree, who cares? Er, the Cowboys play in Arlington, not Austin. 1) take your time; no shortcut is worth the sacrifice in flavor you’ll have at the end. 2) especially true of the beans. Some home recipes cheat at use canned beans. Don’t do that; the beans are every bit as important as the meats. Good luck! I look forward to seeing it on Culinary Corner! Had cassoulet for the first time last week. We went out for my wife’s birthday to a French place in Philadelphia and it was phenomenal. Might have to try my hand at this one as well. J’adore le cassoulet. If anyone has any tried and true recipes please share. Just a brief comment on the advertiser/sponsor difference, but Sauber were very nearly out of the sport due to financial problems before Ferrari (via Alfa) stepped in as their funders and engine suppliers. This legitimately could be considered a sponsorship, especially since motorsport has a long history of teams requiring advertising funding to cover the large expenses associated with racing. I believe the Charlotte Checkers’ Hurricanes sleeve patch is simply upside-down (or, if you prefer, rotated 180 degrees), not backward. Sure, the red-black orientation is reversed, but that’s due to the rotation. In other words, I *think* the patch itself is fine; it was just applied incorrectly. Jared Goff had 3rd shade of blue on his uniform yesterday: A Patriots Blue crash-smudge on his helmet. Isn’t it possible that Alfa Romeo more than just an advertiser for the Sauber F1 team as Alfa Romeo is a car manufacturer? Even though the F1 cars will still use Ferrari engines, part of the agreement is a “technical” partnership. The articles don’t seem to make clear what this partnership consists of though. Alfa Romeo and Ferrari are part of the same company so it’s basically Ferrari sponsoring their satellite team. Sauber were also in danger of folding due to lack of sponsorship money so this really is a legitimate case of sponsorship versus advertising, especially given motorsport’s history of needing sponsorship money to cover operating costs of running a race car. Incidentally Ferrari have a history of not liking teams which buy their engines to be terribly public about it. Back in the 90s, when Sauber were using Ferrari engines, they were badged as “Petronas”, the Malaysian gas company which sponsored the team, and I don’t think any team which used Ferrari engines has displayed Ferrari decals on the car. Same with the old Prost team which briefly had Ferrari engines badged as Acer (the computer company which was the team sponsor). So a beefsteak is the name of a cut of meat *and* an event? How did the latter come about? Seems really odd. I have never been to a taco or a buffalo wing. Just wanted to pop in and say that I LOVE that hand-drawn Todd Gurley shirt. I did enjoy the Super Bowl as a football fan. I appreciate a lot of aspects of the game. It was a true display of solid defensive play, great defensive game planning, and some solid punting and punt cover. A note about the Boy Scouts football helmet…the BSA actually bans Varisty Football as an activity. When did the Giants decide to change from AT*T Park to Oracle park? Steve, I’d pay you to make me a custom Giants jersey shirt. Great work dude, best one yet this year! This year SB was a little bit boring. I can’t say this about nightclubs listed here https://best-vegas.com/blog/best-las-vegas-clubs-overview/ , was there last week. Beautiful.